Jessica Simpson looks like she’s ready to drop, but she says she still has a few weeks to go until she gives birth. Jessica Simpson, 31, also admitted she had the fright of her life recently during a bout of contractions which seemed like her first child was about to be welcomed into the world early. Speaking on an episode of The Ellen DeGeneres Show, which aired today, Jessica Simpson shared that she “freaked out” when the pains started. 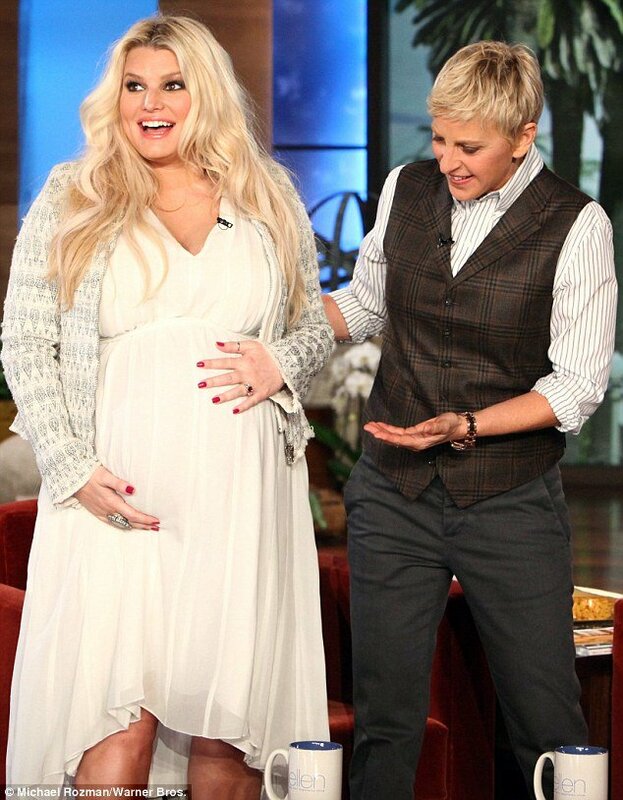 Jessica Simpson also told Ellen DeGeneres that she and her fiancé Eric Johnson are surprised that when they call her bump by the name they wish to give their daughter, she responds by kicking. However amid promotion for her Fashion Star show, which also stars Nicole Richie and Elle Macpherson and begins on NBC tonight, JessicaSimpson is keeping mum about the moniker their first baby will receive. Jessica Simpson is refusing to put her feet up as she does the rounds for her newest career venture. She donned a red pair of wedges on to join the comedienne on the famous red guest chair and looked stunning as she did it. The blonde teamed her daring footwear choice with a demure cream frock with graduated hemline and the mother-to-be looked over-excited to show the studio audience her size of her burgeoning belly. Jessica Simpson even joked about donning high heel slippers in the delivery room and spoke of a special gown for the occasion. The star can be seen caressing her stomach as the comedian looks shocked at the sheer size of it. However, Jessica Simpson confirmed that definitely was not expecting twins despite what it may look like when she appeared with Jay Leno yesterday. Jessica Simpson strutted out onto the stage in a black dress, an animal print cardigan and a pair of sky-high heels. Speaking about the upcoming birth of Jessica Simpson said: “Labor is really going to hurt I have so much respect for my mom and all the women across the world. While Jessica Simpson was discussing her size she also revealed some of her pregnancy cravings which included something she described as “slutty brownies”. They are three layer desert which include a layer of cookie dough and a layer of oreo cookie too. Jessica Simpson also spoke about how she found out she was pregnant – she had a feeling of guilt over plans to drink cocktails with friends so she decided to take a test.